Australians are becoming more fitness conscious. The increased needs of wellbeing for old and middle-aged citizens have yielded an ideal opportunity to launch our massage-spa business and innovatively carve a little deeper into the local wellness-spa industry. Current amplified demand and high-profit margins have attracted an influx of new participants reshaping existing industry’s structure. To achieve a sustainable growth in this diverse industry where massage-spa centres are ten a penny and imitative rivalry is traditionally common, a more holistic approach would be foremost essential. Prior developing our distinctive business-level strategy, it is important to recognise and evaluate the prevailing competitive forces within the wellness-spa industry. Consequently, forecasting and integrating core capabilities with external environmental trends, market dynamics and value-creating processes are also strategically vital. General external environment analysis is a strategic tool that enables businesses to exploit opportunities and neutralise threats by dynamically adjusting their internal environment. The broader spectrum of wellness-spa business portrays anticipated influences of macro-environment on its operations. Therefore, an incessant scanning, monitoring and evaluation of its external determinants are crucial. Australia is the top third country in wellness real-estate after USA and China (Economy Monitor of Global Wellness Institute-2017). The Australian wellness-spa industry is expanding rapidly and tends to associate with other complementary businesses such as health, fitness and alternative medicines. Accordingly, the essence of general external environment analysis has become more significant to recognise the factual indicators of potential prospects and key challenges within this collaborative industry’s fabrics. A recent 2016-AAMT (Australian Association of Massage Therapists) annual report examines several factors of possible benefits of increased competition in the wellness-spa industry. Its recommendations emphasise local businesses to determine the strategic relevance of external industry’s elements such as demographic, economic, political/legal, sociocultural, technological, global and physical. Similarly, International Wellness-spa Summit-2017 shares the demographic, economic and technological dimensions of wellness-spa industry and endorses the wellness-spa industry to be innovative, multidimensional and consumer-driven. According to 2016-Global Wellness Institute’s Research Report, the shifting paradigms of consumers’ physical and emotional needs particularly, amongst baby-boomers have created new challenges for the wellness-spa industry. The emerging wellness concepts, rejuvenating socio-demographic characteristics and advanced therapeutic technologies have transformed customers’ perceptions (Spa Business-2018). Moreover, the necessary confluence of these developments has created more challenges for to stay abreast and combat consumers’ psychographic needs. The 2017-ISPA Spa Industry Study emphasises on the tech-savvy spa balanced between ‘high touch’ and ‘high tech’. Surprisingly, massage practitioners and therapists do not require any pertinent qualifications legally to practice massage in Australia (Ratnam, 2016). At present, mostly external elements are in favour of wellness-spa businesses however, any unsuitable political regime, travel ban and/or imposing new health rules can negatively impact the market concentration and industry’s forces. Porter's industry analysis/five forces framework is an invaluable strategic instrument that holistically evaluates the interaction of industry’s structure and its underlying drivers. The purpose is to determine the profitability of an industry and assist businesses to lever their positions in establishing long-term success. The five forces such as threat of new entrants, bargaining power of suppliers, bargaining power of customers, threat of substitutes and the competitive rivalry are based on microeconomics landscape which provides a benchmark for strategy formulation (Kamran, 2014). Composition and strength of these five forces matter because these collectively affect strategic decisions of businesses and industry’s overall performance. The industry analysis provides businesses an overall forecast at a given time to assess trends in Porter’s five forces and to gauge impacts on the market dynamics (Recklies, 2015). Therefore, systematically analyses of both the competitive forces and the complexity of industry’s structure are crucial for an effective strategic planning. Grant et al. (2014) advocate that the purpose of this industry analysis is not simply to identify the presence of five forces but to understand how these affect an entity and its profit potential. The power relationships among the industry’s forces influence price levels, production costs and investment of entities in an industry (Fitzroy et al. 2016). Magretta (2012) suggests that if five forces are intense then industry faces fierce competition and vice versa. The weakness of industry’s forces allows businesses to sustainably grow and create an attractiveness within an industry. The accurate evaluation of porter’s industry framework requires an in-depth examination of these five forces and is indispensable (Dobbs, 2014). Dobbs expresses that several people only have a shallow understanding of five forces framework which leads to poor judgement and tragic consequences. Porter and Heppelmann (2014) add that existing industry’s structure reshapes when modern technology, skills and customers’ needs shift these five forces. They further explain that digitalisation has dramatically magnified the opportunities and opened new gateways for product differentiation, moving the market away from price-based competition alone. Dalken (2014) concludes that globalisation and deregulation have momentous impacts on the industry’s five forces extending existing industry’s boundaries and shrinking its traditional barriers. Porter believes that these factors are applicable to industry analysis but do not develop an additional force in the framework. Examination of the external environment and its integration with contemporary concepts of globalisation into the discourse framework is not easy, but the payoff is great (McGahan, 2014). Our industry analysis indicates that three forces such as competitive rivalry, bargaining power of customers and threat of new entrants are strong in the wellness-spa industry. While bargaining power of suppliers and threat of substitutes are found modest. At present, the suppliers of wellness-spa industry mostly operate offshore in abundance possessing little bargaining power. Further, Commonwealth’s current regulations do not restrict qualifications and professional licensing for therapists/ massagers, therefore the power of labour supplies is relatively low in Canberra. The local wellness-spa industry is currently experiencing low to a medium threat of substitutes. The close substitutes are home-spa massaging and alternative medicines however, it is hard to imitate due to the third-place environment, interpersonal interaction and socialisation factor. On the contrary, low entry barriers in the accelerating wellness-spa industry appeal new competitors and suppliers. Additionally, high capital investment tends to elevate the exit barriers which indicates interminably intense competition. Established incumbents and new entrants have already fragmented wellness-spa industry by making factors of differentiation more difficult. Although several incumbents are enjoying economies of scale however, low-cost offerings and differentiation can support new contestants to capture their market shares. Hanson et al. (2017) argue that despite the cost disadvantage for new entrants due to learning effects and the economies of scale achieved by existing firms, new competitors may force incumbents to be more efficient to compete on new dimensions. Most of the offerings in the local wellness-spa industry are undifferentiated with little switching costs hence, the bargaining power of potential customers has gradually been increased. The elevating demands of higher quality services, greater value and lower prices exert a formidable force on wellness-spa industry’s abilities to control products’ pricing and costs. Moreover, industry rivalry is found fierce amongst existing competitors who are operating fragmentally in low concentration ratios. Arshad et al. (2016) express an interesting view that despite eroding profitability, intense competitive rivalry brings economic benefits and innovation associated with the companies’ differentiation, efficient production and technical advancement to escalate market potential. It is evident that trends of Porter’s five force framework in conjunction with the general external environment factors present a dynamic picture of competitiveness of an industry (Dulčić et al. 2012). Application of this analysis on the wellness-spa industry suggests that successful strategy is to build a defence against the strong forces such as threat of potential entrants, bargaining power of customers, and intensity of competitive rivalry. Also, finding a shelter at relatively weaker forces such as lower bargaining power of suppliers and the threat of industry’s substitutes would be advantageous. Moreover, if ‘complements’ are to be considered as the sixth force in parallel to the substitutes as perceived by Grant et al. (2014) then Porter’s framework guides us to build strong bidirectional relations with the beauty and fitness centres to enjoy mutually shared bargaining power. Porter suggests three generic business level strategies namely cost-leadership, differentiation and focus which a firm can adapt to achieve its competitive advantage within an industry (Thompson et al., 2016). These generic strategies involve performing offensive or defensive actions by a firm to develop its favourable position while coping with the industry’s forces (Tanwar, 2013). Business level strategies help organisations to outperform their rivals within the same industry (Fitzroy et al., 2012). Bertozzi, 2017 expresses that a firm performs relatively better by choosing one strategy on which to concentrate. Mekic (2014) asserts that without understanding the competitive forces and strategic positioning, an entity may not be able to achieve sustainable profitability even in an attractive industry. The cost-leadership strategy demands a firm to create a relatively low-cost position against its competitors by efficiently managing its value-creating processes driving the costs of interdependent activities (Ouma, 2015). The differentiation strategy allows a company to charge a premium price by creating a perceived uniqueness in its products valued by its customers industrywide (Bordes, 2009). A differentiation strategy can be reinforced and strengthened by securing integration at multiple points along the value chain (Dess et al., 2012). Porter (2008) proposes that a firm’s competitive advantages can also be achieved by selecting target segment(s) to serve an industry’s niche while seeking a narrow competitive scope through its focus strategy (Wheelen et al., 2015). Combining multiple strategies is possible; however, hard to sustain over time due to potential imitation and substitutions (Banker et al., 2014). Jones et al., 2017 contradicts the multiple-strategy and argues that businesses stuck in the middle tend to have lower levels of performance. Firms can't outstrip their rivals by trapping into the strategic straddling and merely adopting operational effectiveness. In fact, companies require a reinforcing system to interlock all individual activities making it difficult to disentangle and replicate which result in the increased competitive advantage (Banker et al., 2014). These strategic fits among interrelated activities help firms to steadily increase differentiation and reduce their costs. However, a strategic position is not sustainable unless firms experience trade-offs. Trade-offs are essential to strategy and create the needs of choices for protections against re-positioners and straddlers. Porter and Heppelmann (2014, p.76) argue that trade-offs involve deciding what the firm will not do when some of the activities are incompatible. A differentiation strategy is found best-fit for our massage-spa business to secure a viable position within the wellness-spa industry. Tanwer (2013) suggests that differentiation strategy generally forms a better entry barrier against future entrants by its distinctive competence and customers’ loyalty. Further, a combination of product differentiation and market segmentation strategies is anticipated more effective by matching both supply and demands sides. This will assist minimising the risk of rivalry’s imitation of our wide-range offerings. Further, in today’s dynamic environment, the nature of differentiation is mainly based on intangible features that are hard to quantify (Bolton et al., 2014). Therefore, in addition to traditional mechanism, smart-connected expertise and innovatively target-specific marketing techniques would also be beneficial for long-term sustainability. Porter’s value chain analysis is a critical tool to identify strategic relevance and distinct potential from start to finish of a company’s discrete activities creating superior value (Turban, 2004). A firm's value chain is part of a larger system represents value chains of upstream suppliers and downstream clients (Amara et al. 2016). The formation of value chain does not simply exist in an organisation but are cultivated over time (Donavan et al., 2015). To gain the competitive advantage, a firm must either perform the value chain’s activities more efficiently or in a unique way that creates higher value (Norasucha, 2007). The physically and technological functions of primary and support activities synergise to complement a value chain’s external and internal operations. Therefore, configuring a chain of activities add more value to products than the accumulation values for all activities. Once value activity is captured, businesses develop uniqueness strategy that leverages their position to charge higher relative-price in competition. Langviniene (2010) argues that value is co-created with customers therefore, flexibility must be a prominent feature of a value chain. In fact, the nexus of competitiveness lies within the alignment of a firm’s value chain, its products and processes’ architecture (Holweg and Helo, 2014). Hart and Dowel (2011) suggest that in emerging environments, firms need to create incremental strategies by developing dynamic capabilities through reconfiguration of internal and external competences. Further, the operational and financial performance of the value chain depends upon the resource efficiency which should be integrated more intensively as supporting instruments to improve business decision-making (Geibler et al., 2016). The resource-based view framework (RBV) addresses the accumulation of valuable, rare, inimitable and non-substitutable (VRIN) resources as the basis of enterprise competitiveness (Lin and Wu, 2014). However, it becomes controversial when framework assumes the collection of unique resources and inimitable capabilities by organisations (Wernerfelt, 1984). Porter (2008) stresses that in the competitive edge where firms have control of similar resources, they may deploy identical strategies that limited their differentiation advantage. The firms can improve performance by accumulating VRIN and developing dynamic learning capabilities. Nevertheless, they can’t achieve a sustainable competitive advantage by controlling such perishable resources. Further, the elevated novelty of resources may be risky for a firm operating on VRIN, especially when it experiences a deficit in managing its innovation processes (Koc and Bozdag, 2017). Accordingly, we anticipate bundling of our stewardship, dynamic capabilities, core competencies and efficient value chain processes to establish uniqueness and develop value-proposition. Primarily, the massage-spa ecosystem operates on human-centric products therefore, proficient resource management would be the utmost priority. Voudouris et al. (2007) conclude fundamental of success relies on effective chain management and resource training in WIPE framework (waiting, idling, performing and experiencing). Furthermore, the fusion of tangible and intangible resource enables a dynamic concept of fit-for-all within the value chain to trigger competitive advantage making imitation more difficult. Porter’s series of strategic tools and framework provide guiding principles to the businesses seeking sustainable competitive advantage within industry’s multidimensional environment. Industry structure and its dynamics determine the power of competition which aids firms to secure their persuasive position. A strategy is not to trounce or eliminate rivals but to raise profit potential through value proposition hitting customer’s sweet spot(s). Companies can gain superior performance through an innovative integration of efficient value chain and core competencies to outweigh external environment. For strategic leverage to be genuinely efficacious, it is also incumbent to recognise and evaluate firm’s best fit and trade-offs. To counter the identified industry’s forces, safeguard our customer’s loyalty and to build relatively higher entry barrier for potential entrants, our recommended differentiation strategy will prevail. The plummeted switching cost attracts new customers but to lock them, our massage-spa business to offer unique rewards policy. In the war of profit attrition and exploiting myriad of new opportunities, we endorse continual scanning and abreast adaption corresponding to external environmental trends. We also suggest harmonising our traditional massage-spa business with its interdependent industries such as health-fitness sector and implementing the best value-creating procedures. Banker, R.D., Mashruwala, R. & Tripathy, A., 2014, Does A Differentiation Strategy Lead to More Sustainable Financial Performance Than A Cost Leadership Strategy ? management Decision, vol. 52, no. 5, pp.872-896. Dess, G., Lumpkin, G., Eisner, A. & McNamara, G., 2012, ‘Strategic Management: Creating Competitive Advantages’, edn.6, McGraw-Hill: New York, NY. Fitzroy, P., Hulbert, J.M. & Ghobadian, A. 2012. ‘Strategic Management: The Challenge of Creating Value’, edn.2, p.124, New York, NY: Routledge. Grant, A., Butler, B., Orr, S. & Murray, P., 2014, ‘Contemporary Strategic Management: An Australian Perspective’, edn.2, Wiley: Milton, Qld. Hanson, D., Hitt, M. A., Ireland, R. D. and Hoskisson, R. E. 2017, ‘Strategic Management: Competitiveness & Globalisation’, edn.6, p.53, Asia Pacific, Cengage Learning Australia Pty Ltd, Melbourne, Vic. Magretta, J., 2012, ‘The Five Forces: Competing for Profits’, (Ch.2), Understanding Michael Porter: The Essential Guide to Competition and Strategy, p.50, Harvard Business Review Press: Boston, MA. Mekic, E. & Mekic, E., 2014, ‘Supports and Critiques on Porter’s Competitive Strategy and Competitive Advantage’, Conference Paper: International Conference on Economic and Social Studies. 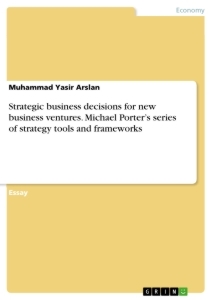 Porter, M. E., 2008, ‘ Competitive Strategy: Techniques for Analyzing Industries and Competitors’, New York, USA, Free Press. Thompson, A.A., Peteraf, M.A., Gamble, J.E. & Strickland III, A.J., 2016, ‘ Crafting & Executing Strategy: The Quest for Competitive Advantage Concepts and Readings’, edn.20, McGraw-Hill: New York, NY. Transforming organization in the digital economy. John Wiley&Sons Inc.
Voudouris, C., Owusu, G., Dorne, R. and Lesaint, D., 2007, ‘Service Chain Management: Technology Innovation for The Service Business’, Springer Science & Business Media. Wernerfelt, B., 1984, ‘ A Resource‐Based View of The Firm’, Strategic management journal, vol.5, issue2, pp. 171-180. Wheelen, T.L., Hunger, J.D., Hoffman, A.N. & Bamford, C.E., 2015, ‘ Strategic Management and Business Policy: Globalization, Innovation and Sustainability’, edn.14, Pearson: Upper Saddle River, NJ. Vertrauensarbeitszeit. Das Arbeitszeitmodell für jede Arbeitssituation?